Andrews McMeel Publishing, 9781449430580, 240pp. Doonesbury has managed to be articulate, abrasive, political, compassionate, misunderstood, misprinted, and outrageous--but one thing it's never been is complacent. Garry Trudeau's creation has chronicled American history and culture in a parallel universe. And through it all, Doonesbury has always been honest, entertaining, and way, way cool. 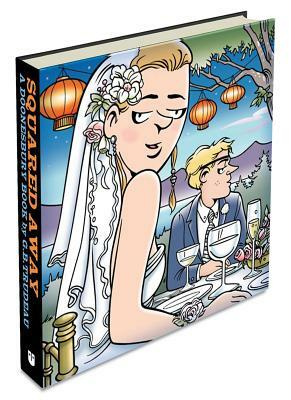 This all-color volume celebrates the marriage of Alex and Toggle, an event which optimistically confirms that life, like Doonesbury, rolls on. Indeed, how remarkable that the strip has so embraced and occupied its era that three generations of one family have married within its panels. Gathering their kith and kin around them at Walden, the wise but wounded soldier-artist and the brilliant but insecure techhead make a promising team for the years ahead, well-rounded yet squared away. Doonesbury's fifth decade finds the largest rep company in the history of comic strips fully and widely engaged. Like so many flesh-and-blood fellow citizens, key characters now struggle with dramatic career change and job stress. And the wars in Iraq and Afghanistan continue to reverberate through the lives of others, as the strip illuminates their experiences with an attentiveness unparalleled in popular culture. Amid the relentless unfolding of unexpected storylines, the strip's second and third generation characters increasingly take center stage, and the youngest regular, Sam, comes of age--literally in the blink of an eye--as the newlyweds prepare to welcome twins. It never ends, and how lucky for readers. "Most comic strips run out of creative energy after their initial inspiration," notes Garry Wills. "Trudeau has just kept improving, year after year.